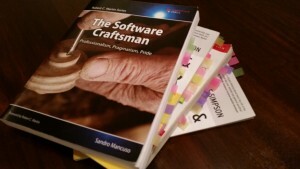 Over the past few of years I have read a lot on programming and other technical topics. Some of the books have been very in depth with lots of detailed code examples. It’s easy to say you read a technical book on a given topic. It’s harder to say you understand and retained what you have read. I found myself trying to read as many books as I could and not truly comprehending the topic I was reading. So over the past year or two I have found a couple of tips that have helped me slow down and become more productive when reading technical/programming books. No I’m not talking about browser tabs. When I read any technical book I use page tabs and mark pages that have content that resonates with me or I find to be very useful. You can use any color system, this is just the one that has helped me. Any type of page tabs will work. I use something similar to this. Also it is important to have these things everywhere! I keep a set in my personal desk, work desk, and my backpack. I can always mark things down no matter what I am reading. Another great tip that has gone a long way is to read each chapter twice before moving on to the next chapter. I first heard about this when reading Dale Carnegie’s How to Win Friends & Influence People. This is great advice. This forced me to slow down and understand the concepts that I am reading. I can’t even think of how many times I have re-read a chapter and realized I missed a subtle detail or technical tidbit that was important. It may take me twice as long to read a book but I get far more information out of it. Making reading a habit can be difficult. When it comes to technical books going long periods of time without reading can really trip up your learning. Only reading a few pages every few days or once a week makes it hard to remember what the topic or context was the last time you read it. It’s similar to not seeing code you wrote in over a week. Make it a habit to read every morning or night. Even if it’s for only 10 minutes. It’s a lot easier to remember what you read for 10 minutes last night than what you read for 30 minutes a week ago. This was one of my greatest struggles but I can assure you that it really does make a difference. In Cory House’s Pluralsight course Becoming an Outlier: Reprogramming the Developer Mind he suggests having a bookshelf at work. Having a bookshelf with your programming books can help serve as a positive reminder of the topics you have learned. People can see topics you know or are interested in, which can help start conversations between developers. Making your skills more visible to other developers can make you more valuable to a team. This can also help identify what topics would be most valuable for you to read up on. These are just a few of the things I have tried that have really helped me become better at reading programming and technical books over the past year. I’d love to hear other peoples ideas and advice on this topic in the comments! Reading it twice is definitely an effective tactic for learning in more detail. If the technical topic is new, then its usually an achievement to just absorb the overall concept the first time. Once you have this understood its a lot easier to pick up on the details on the second run through. Sometimes I reread on a page by page basis rather than chapter by chapter. I feel that I’m moving through the book more that way although I doubt that it is any quicker overall. I think it depends on whether or not the book is structured so that you need to fully understand the earlier material before moving onto the next section. If its written in a way that moves onto new areas rather than building up then I’m more likely to read all the way through the book and then reread the whole book again when I need to understand it in more detail. It’s the same for online courses as well, I often can’t absorb all the information the first time round, but it always makes more sense the 2nd time. Good points! I definitely read some chapters a few times before moving on depending on the topic. I have a handful of books that I reread when I am between new books just to try and refresh my mind on certain topics. For my technical books, I like like to preview each chapter by reviewing the detailed table of contents before starting the book. Then I set a time goal for completing each chapter, easier chapters might be assigned one day, more detailed chapters, especially those with a lot of code may take 2 days. I never thought about using the table of contents as a way to set goals. I’ll have to give that a try! Excellent tips. I heard of the tab technique sometime ago but never applied it. I’ve read some tech books in Kindle format…and it just feels weird. Not sure why. You’re on to something. Studies have found we retain more information when reading from paper books than via a screen. Holding the book, seeing physically where you are, physically turning the pages all contribute to superior retention. You wouldn’t think these matter, but studies show they do. I also try out same code examples but with a personalized version e.g a list of fruits will be list of my friends.